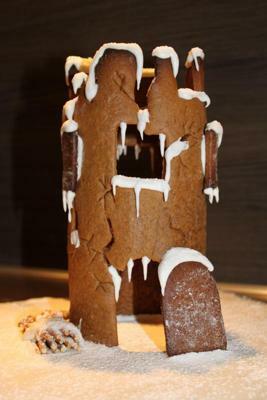 I first came up with the idea when I took a, should be perfect, castle out of the oven and saw what a mess it was, to much Molasses made the castle into a ruin. But a real ugly one, but when I started to put some Icing on there, it gave a great charm. So the next one was made to be a ruin and here is the result. I will be uploading all the photos to my website soon.